Jack, a five-year-old neutered male Shepherd mixed dog, has been wearing a PetPace collar long term to help monitor his epilepsy. Recently, over the course of several days, Jack suffered from severe gastroenteritis after eating deer feces, and required medical treatment. 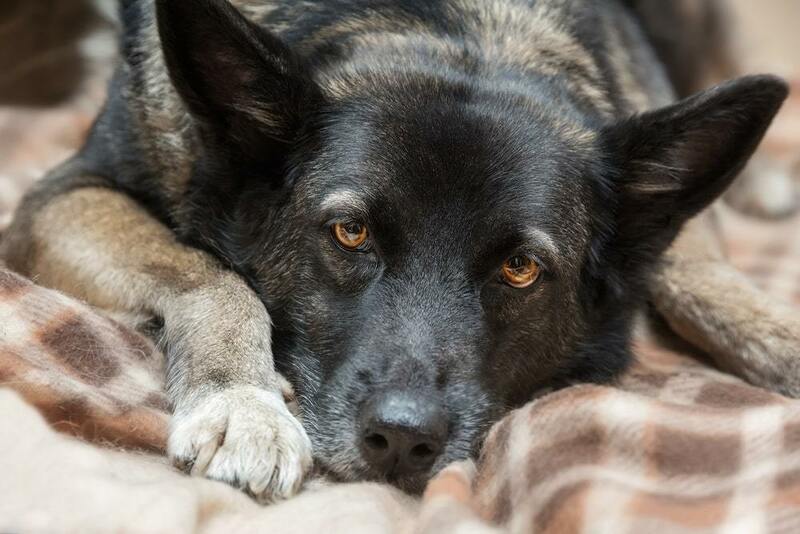 Acute gastroenteritis, or inflammation of the digestive tract, is common in dogs because of their tendency for indiscriminate eating. After ingesting garbage, feces, dead animals, or other unsuitable materials, the delicate intestinal balance is disrupted, causing symptoms which typically include vomiting, diarrhea, inappetence and lethargy. Most of these cases are self-limiting, but severe cases may require medical treatment. The PetPace collar documented multiple physiological and behavioral changes during Jack’s bout of gastroenteritis. According to Jack’s owner, soon after consuming deer feces during a walk, Jack began showing symptoms including diarrhea, lethargy and inappetence. He required medical treatment and antibiotics (Metronidazole) and only after five days he returned to normal. Jack’s PetPace collar accurately detected those five days of illness through changes in multiple physiological and behavioral parameters. Notably, Jack’s pulse rate increased significantly during this period, as can be seen from the graphs below. *MINUTE-BY-MINUTE MONTHLY PULSE TRACING, SHOWING AN ACCUMULATION OF ELEVATED PULSE DATA POINTS DURING THE DAYS OF GI DISTURBANCE. *ACUTE ELEVATION OF THE MAXIMUM PULSE RATE DURING THE DAYS OF ILLNESS. *THE ACUTE ELEVATION OF THE MAXIMUM PULSE RATE DURING SICKNESS BECOMES MORE OBVIOUS WHEN PULSE FROM THE NIGHT HOURS IS ISOLATED AND DISPLAYED. Jack’s respiratory rate was mildly affected, showing a transient increase in the minimum respiratory rate, especially during the night hours. This increase was mild and resolved after only three days. The PetPace collar showed that Jack’s activity level was decreased during the sick days but gradually increased back to typical levels after the clinical signs resolved. *ACTIVITY CHART SHOWING OVERALL DECREASE IN ACTIVITY LEVEL DURING SICK DAYS. Another indication for the gastroenteritis episode is seen in changes in Jack’s typical positions. For example, decreased time spent standing and more time spent lying down is indicative of weakness and lethargy. *STANDING POSITION TREND CHART SHOWING DECREASE IN TIME SPENT STANDING DURING SICK DAYS. *LYING STERNAL POSITION TREND CHART SHOWING INCREASE IN TIME SPENT LYING DOWN DURING SICK DAYS. HRV (Heart Rate Variability), a general marker for pain and stress, also clearly indicated the days Jack was not feeling well. *HRV (TRIANGULAR INDEX) SHOWING ACUTE DECREASE DURING ILLNESS AND SLOW, GRADUAL RETURN TO NORMAL LEVELS. *Another HRV index called VVTI (Vaso-Vagal Tonus Index), which is usually low for Jack because of his epilepsy (left chart, showing 5.7% red points), had a significant percentage increase in low (red) data points during the days of illness (14.5%, right chart). Finally, Jack spent no time in the eating/drinking position for five days, starting the day after eating the feces. This corresponds to his owner’s observation of inappetence. *EATING/DRINKING POSITION CHART DOCUMENTING INAPPETENCE DURING THE DAYS OF ILLNESS. Multiple parameters, including pulse, respiration, activity, positions and HRV diverged from their typical values during the five days that Jack was sick with acute gastroenteritis following ingestion of deer feces. As expected, changes in Jack’s pulse and respiratory rates were more readily visible during the nighttime, because there are fewer possible interferences and confounding factors. During the day other elements that may induce a higher pulse or respiratory rates can mask the effects of an illness on the vitals. Pulse rate was affected to a higher degree and for a longer time than the respiratory rate. Increased pulse rate, especially during times of decreased activity levels, is a strong indicator of a health problem. HRV repeatedly demonstrates an ability to serve as a general marker for disease or stress. Different HRV indices provide different angles to assess a condition, as seen here with Jack’s VVTI and Triangular Index. Interestingly, some HRV indices show a slow return to normal levels, despite the resolution of symptoms and normalization of vital signs. This could perhaps be an indication of a longer, post-symptomatic, physiological recovery process. The PetPace system provides a rich database for each monitored patient. Monitoring these parameters, analyzing and detecting deviations from typical patterns, provide highly-sensitive, real time indications for various health problems.